We have one of the largest selections of GORE-TEX products on the web, a super knowledgeable staff and expert guides to help you make an informed decision. GORE-TEX is a family of high performance weather protection apparel, known for its durability, breathability, and waterproof characteristics. GORE-TEX comes in two flavors, divided between traditional waterproof “black diamond” GORE-TEX and weather-resistant but not completely waterproof “white diamond” GORE-TEX INFINIUM™ products. Traditional black diamond logo GORE-TEX waterproof products have a focus on maximum weather protection, while white diamond GORE-TEX INFINIUM™ products focus on versatility and functionality, when comfort and performance take priority over complete waterproofness. Click a logo to learn more about a GORE-TEX line. 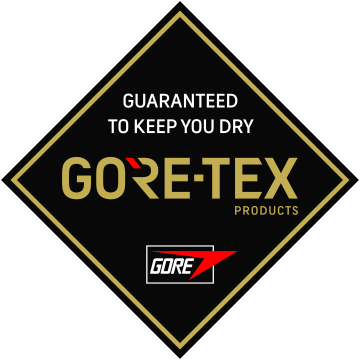 GORE-TEX is a proprietary waterproof breathable product line with exceptionally high standards, ideal for users who want to be protected even through bad weather in extreme conditions. Manufacturers using GORE-TEX fabric are required to use GORE-SEAM® tape and specialized seam sealing machinery to ensure a proper seal, and to provide random samples for testing by GORE’s headquarters throughout a product's production run. The use of the GORE-TEX membrane is tightly controlled, and how it is used with face fabrics in garments is watched to ensure the customer is receiving a quality product. GORE stands behind the quality of black diamond logo products with a guarantee, and will repair, replace, or refund a product that has failed in waterproofness, windproofness, or breathability. The foundation of GORE-TEX waterproof-breathable products is the strong and microporous expanded polytetrafluoroethylene (ePTFE) membrane. This membrane is typically bonded to durable face fabrics for longevity and abrasion resistance. There are different categories of GORE-TEX in outerwear, with different ideal uses. GORE-TEX Pro is the ultimate in durability and protection, for users who need the hardest wearing materials they can get. GORE-TEX Active for fast and light travel, while GORE-TEX Paclite is designed for all-weather protection that can be stowed away in a smaller pack for protection in a pinch. These different versions of GORE-TEX come with different backers on the interior of the garment, such as a C-KNIT backer for a gentler hand and next-to-skin comfort on certain 3-layer products, a traditional and reliable tricot, or sometimes without a backer at all in 2.5 layer Paclite for minimalists. Older versions of GORE-TEX products may use the names GORE-TEX Pro Shell, GORE-TEX Active Shell, GORE-TEX Performance Shell, GORE-TEX XCR, and others. Each square inch of a GORE-TEX membrane contains 9 billion pores. Each microscopic pore is 20,000 times smaller than a water droplet, but 700 times larger than a water vapor molecule, resulting in a membrane that prevents water precipitation like rain and snow from penetrating through into your layers, but still allowing sweat vapor to escape. When combined with wicking layers and insulation for proper moisture and warmth management, GORE-TEX can help to keep you drier and more comfortable. GORE tests products both in the lab and in the field to try to cover as many uses of their products as possible. GORE-TEX pieces are tested for resistance to abrasion and flex, overall longevity in extreme temperatures, and for comfort through heavy precipitation. Footwear goes through up to hundreds of thousands of steps in a water bath and is checked for leaks and proper wicking performance. Glove designs get checked for proper water repellency and breathability, and to make sure you are receiving something that is comfortable and easy to control your fingers in. No GORE-TEX product design reaches you without first being taken through the testing gauntlet. 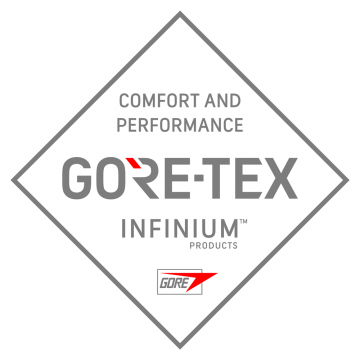 GORE-TEX INFINIUM™ products, typically identified by the "white diamond" logo, are designed for weather-resistant comfort and performance instead of complete waterproofness. INFINIUM™ garments with a persistent beading surface feature a water resistant outer layer with a soft feel, designed to repel light rain and snow so that water runs right off the exterior. Keeping water out keeps your garment light and comfortable, while a totally windproof construction still breathes and allows moisture to escape to help prevent clamminess. Persistent beading surface outerwear is a good choice for variable weather protection in moderate climates. GORE® WINDSTOPPER® garments offer light and mobile protection against the wind for a balanced microclimate even during more intense activity. All WINDSTOPPER® garments are durably windproof, water resistant, and highly breathable to help reduce the risk of overheating. These fabrics are often treated with a durable water repellent (DWR) to provide additional resiliency against the weather. WINDSTOPPER® is a good balance between coverage and protection from most weather conditions without the bulkier construction of a fully waterproof option. Footwear products featuring GORE-TEX THERMIUM™ technology offer insulation and style that is warm outdoors and comfortable indoors, with a slim silhouette and a compact profile that protects your toes while keeping a clean aesthetic without the bulk. This helps keep your feet noticeably warmer than they would be with uninsulated shoes while remaining comfortable indoors. GORE-TEX THERMIUM™ footwear helps keep you comfortable in more weather without needing an arsenal of super specialized shoes or boots. GORE-TEX INFINIUM™ gloves with stretch technology are made to be slim fitting for dexterity and feature a soft-to-the-touch material with 3D-shaped construction. Infinium stretch gloves are highly breathable and totally windproof for performance in a range of weather and activities. Too many seams and too much bulk in other gloves can make dexterity difficult. GORE-TEX INFINIUM™ gloves with stretch use single-seam construction to minimize points of failure and to create a close fit. This helps you get more done (like tying and untying your fresh new boots) without needing to take off your gloves. For more information on taking care of your GORE-TEX fabric, see our "How to Wash and Keep GORE-TEX Waterproof guide below!